Something to look forward to: During the opening keynote of its 2018 developer conference last week, Samsung unveiled its long-rumored Infinity Flex Display. Now, a new report claims to reveal the name, release date, and price of the upcoming flexible smartphone, and, as predicted, it’s going to cost a lot. Back in June, Kim Jang-yeol, head of research at brokerage firm Golden Bridge Investment, said Samsung’s bendy handset would cost just over $1800. A new report from the Yonhap News Agency in South Korea says it will be slightly under that figure at $1770, though the company hasn’t settled on a price. Speaking to the Korea Times, Park Hyung-woo, an analyst at Shinhan Financial, said Samsung Electronics' handset division will start receiving parts from suppliers this month, and the company hopes to launch the phone sometime early next year. 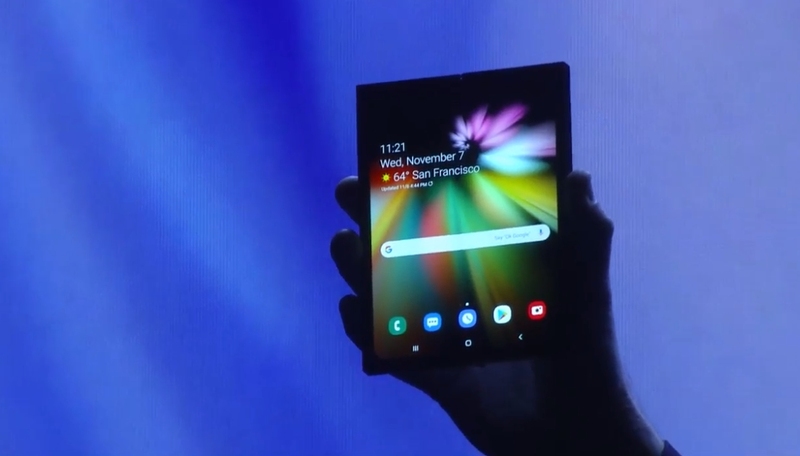 Samsung chief DJ Koh has already said it plans to ship a million foldable devices in 2019. Yonhap News has reported a more specific launch window. It says the bendable phone will arrive in March, a month after the Galaxy S10 is unveiled—probably at Barcelona’s Mobile World Congress. Interestingly, the publication’s industry sources say the S10 will be 5G enabled, though Koh did say it wouldn’t be Samsung's first 5G phone. Finally, there’s the name. While it’s long been referred to as the Galaxy X, insiders say the flexible phone will be named the Galaxy F, and, despite the high price, it won’t support 5G. Samsung disguised elements of the screen’s design at last week’s conference, but we did see the prototype unfold from what looks like a regular smartphone into a 7.3-inch tablet. Koh says that if it proves successful, Samsung will release a new versions of the Galaxy F (or X) every year, much like it does with the Note and S series.